The Rama V Weekend Lunch á la carte Buffet is such a steal! 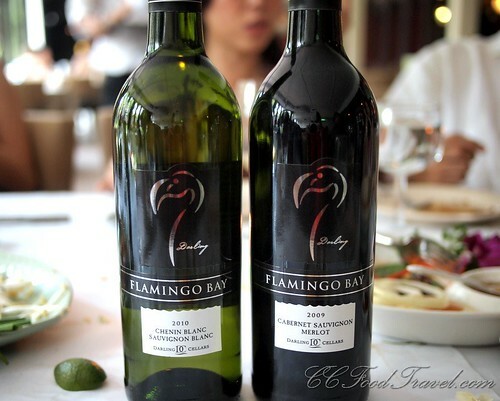 It’s a eat and drink all you can buffet menu, and believe me, the wine and food is terrific, considering the fact that you’re only paying RM68.90++ and for top quality Thai cuisine as well. The wine, and beer are free flow all throughout lunch. Walking into Rama V is always a welcoming experience – I always feel like I’ve walked into the living room of some Thai Ambassador’s home. Tasteful chandeliers draped in corners, Thai decoratives sit on beautiful antique tables, ornaments dangle from the ceiling and the whole place has a distinctively classy Thai air about it. 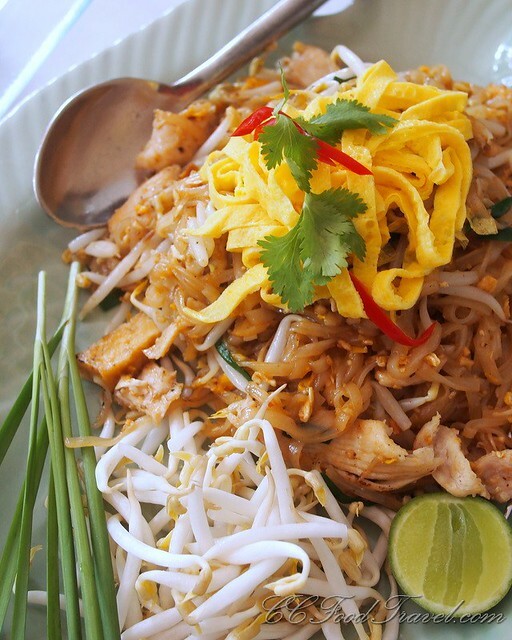 Thai cuisine, known for balancing sour, sweet, and salty flavors with chili-infused heat, is represented at Rama V, by Thai cuisine of every persuasion.. myriad curries, deep-fried or sautéed duck curries, and chicken, beef, or seafood in sweet chili or hot curry pastes. 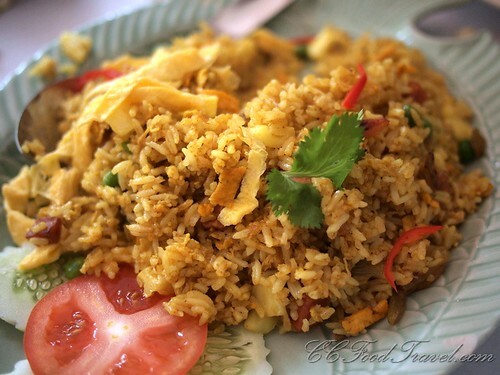 Most of Rama V’s dishes originate in Bangkok, and are less spicy than the cuisine of the firecracker south. Salads are fresh and brightly flavored. 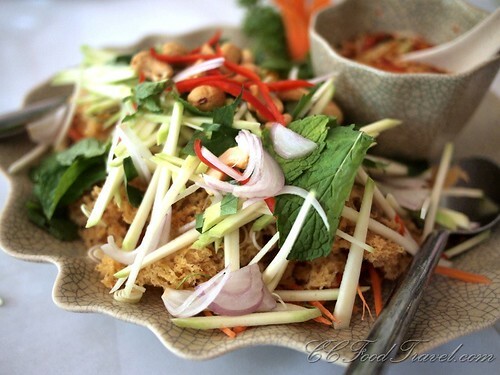 A crispy fish salad doused in a sharp-and-tangy lime and chili sauce that spills over onto a bed of cashew nuts, julienned green mango, cucumbers, onions and garnished with juicy mint leaves, is substantial and satisfyingly complex, as is texturally stimulating. The clear Tom Yam soup really stole the show with a great aroma of mussels and seafood permeating this all time Thai favourite. Wedges of crispy, succulent reconstituted chicken which are stuffed back into the shape of a chicken wing and served with a sweet and tangy chili sauce studded with chilie bits were a delightful surprise. And though the Thai cuisine served at Rama V looks spicy, nothing on the menu is actually too fiery that it should shock you out of your seat. Heat freaks, take a note – you may find the dishes too mild, but you can always request for Rama V’s special chili padi sambal to add some fierceness to your meal! So, what on earth, is an á la carte buffet? Well, this buffet just means that you are allowed to order off the á la carte menu, at 5 dishes per time, per person. But essentially, though it is á la carte (in quality), it’s still an eat all you can buffet. And you can keep going and ordering, so long as you finish all the food you order. There is no catch – it’s really that affordable and the booze is free flow too. We had so many terrific starters to choose from, we had to mentally tell ourselves to slow down, as we had not even reached the mains yet. 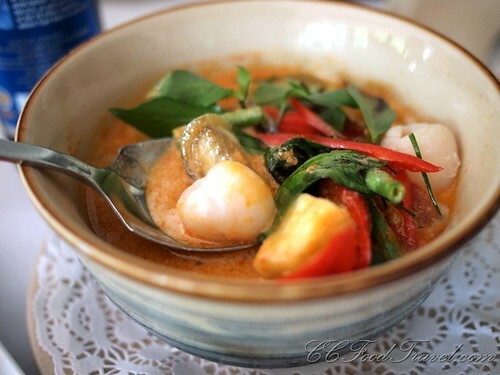 If you want authentic Tom Yam Pla Chon (without coconut milk), this is the one. Featuring all four of the famous Thai spices – salty, sour, sweet and spicy – this Tom Yum soup served at Rama V provides a pungent and zesty feast of flavors with every slurp. 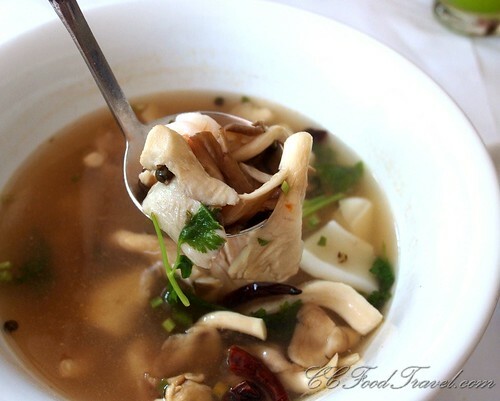 The boiled lemongrass, chilies, and galangal make this soup a must have dish, to accompany any Thai meal. This is a fun salad to order, and one of my favorites. Frying the shredded catfish creates a cloud of delicious crispiness, hence its name. When paired with the sweet and sour dressing and crunchy green mango, the perfect balance is created. 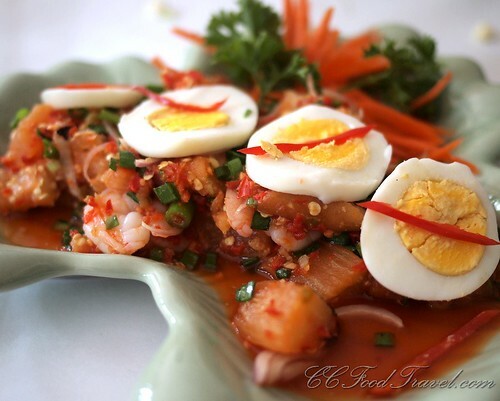 This dish was new to me – Grilled eggplant, shrimp, hard boiled eggs, onion, dried shrimp and shallots tossed in spicy lime juice. I loved the juicy texture of the eggplant .. and who can go wrong with hard boiled eggs (incidentally, this is my staple before a strenuous workout) and fresh shrimp. 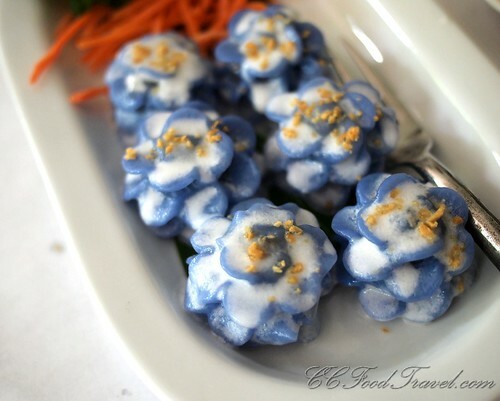 A gorgeous dish that needs no intro – this is like the blue flower trademark of Rama V. The Chor Ladda is a flower shaped dumpling stuffed with minced chicken and peanut. 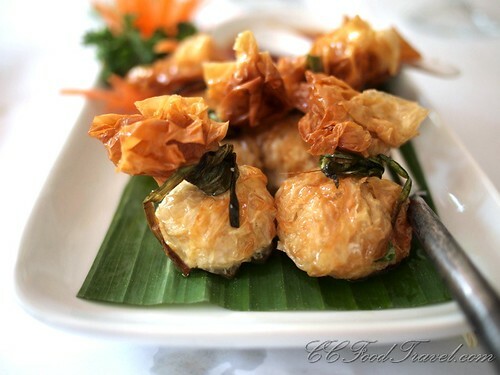 The combination flavours of savoury, fragrant and titillating textures from the peanuts, confer a nice crunch to the dumplings, as the little blue sacks explode when you bite into it. Ah, this was the starter that Cumi and I loved! It reminded us of the reconstituted fish dish we like – only this was chicken. These stuffed chicken wings were delicious. 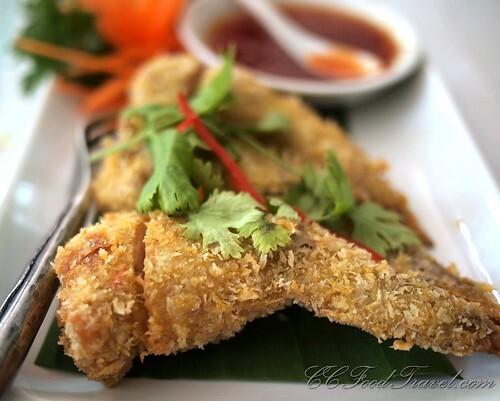 Super addictive and crispy on the outside with a tasty minced chicken and mushroom stuffing. Another great one for the kids. An all time favourite – the lychee in this curry really accentuates the flavours of the duck. Everybody loves a good pandan chicken and especially so, if you have kids in tow. 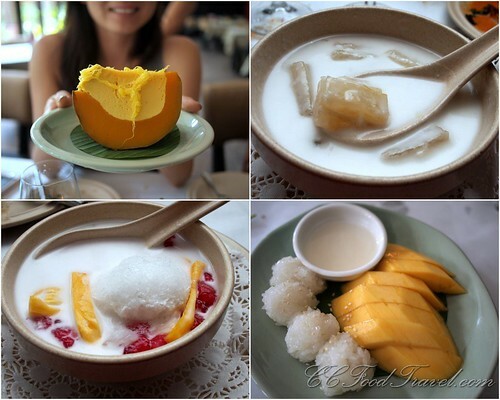 This is the Kai Hor Bai Toey. This fried chicken in pandan leaves is meaty, juicy and tender, and you don’t even have to de-bone the chicken. 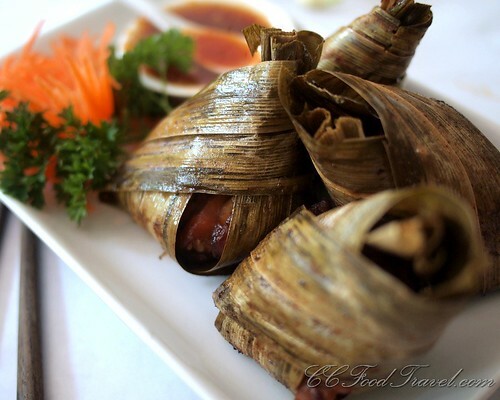 The heavenly aroma of pandan leaves permeate the chicken making you want to reach for more rice! 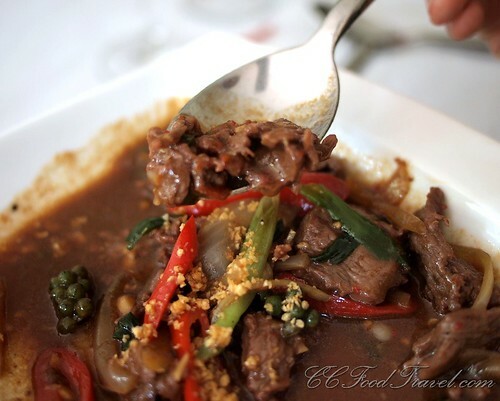 Extraordinarily tender, melt in your mouth beef. A must order. 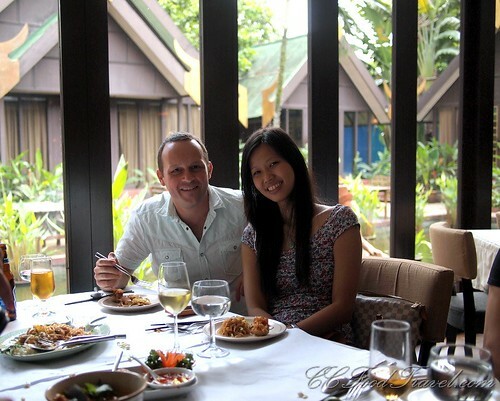 After lunch, we go upstairs of Rama V, to take a look at the latest edition to the family. A spacious, multi-function room that has been sheathed with tasteful wood frames and swags of Thai silk is the latest extension of Rama V. Situated upstairs of the main bungalow, this fully AV equipped , meeting room is available of rental. A couple of tastefully auspicious framed Buddha pictures adorn the walls. 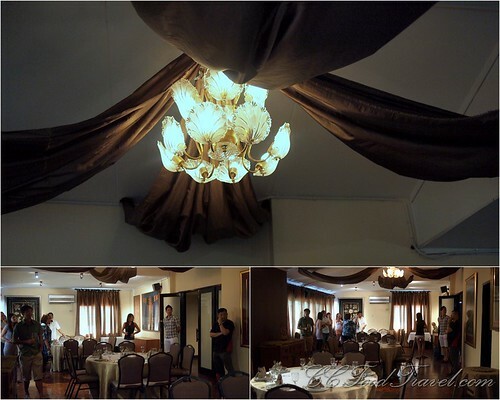 The room can sit 50 pax comfortably for round table dining; for theater style meetings, 70 pax, and has space to spare for a buffet line up, at the back of the room. It comes furnished with and en suite bathroom, for the guest. With that, we end lunch on a high note – a great Weekend á la carte Buffet Lunch indeed at Rama V! We will be back! Yikes.. crying with pain! LOL. I’m not as brave as you. The slow burn sort will do.. for me anyway. Fantastic 🙂 Well done to Andre and Danny for extending their offering to upstairs! ‘Twas an awesome lunch hoh? I certainly will go again! Jom!